The Battle Of Midway project is at a standstill at the moment as a pending move has forced me to temporarily pack all my modelling stuff. Now it's less than three weeks left until I should be able to start again. This however does not hinder me to give an update on my progress. I've completed four kits this far. The Zero, the Val, the Wildcat and the Catalina. I've done the Zero flown by Lt. Cmdr. Shigeru Itaya who led the first wave at Pearl Harbour just six months before the Battle Of Midway. At Midway he led the Zero fighters during the operations. In particular he led the attack on the 15 ill-fated TBD Devastators from the USS Hornet which were all shot down. Later, after his carrier Akagi had been sunk, Itaya ditched his Zero close to the Japanese fleet and were rescued by escorting ships. In 1944 he was killed when a Mitsubishi G3M "Nell" he flew in accidentally was shot down by friendly fire over the Kuril islands. There is still some debate on which plane he flew (see earlier post) and there is some on the internet that suggest it might not even have been AI-155 but AI-159. Still most sources I've found say 155. 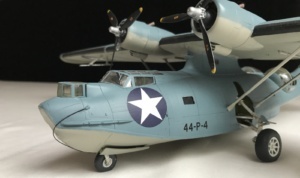 I've written a review of the kit from Hasegawa that you can read here. The Val I built participated at the attack on the Midway island (at least if you're to believe Hasegawa). I don't have any information on the crew or more information than that this aircraft was based on the carrier Akagi. The attack on Midway was partially a failure as the American knew of the attack beforehand and could prepare a defence. Still there is no downed Vals reported from the attack (the Kates and Zeroes were less fortunate). I think that it's safe to say that all the Vals were lost in the operation, most either went down with their carriers or was forced to ditch in the sea. If you're interested I've written a review of the kit here. This version of the kit can be hard to find though as it's decommissioned. I found my at Ebay. 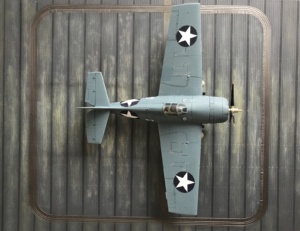 The Wildcat I've built was flown by Lieutenant Commander John Thatch during the Battle Of Midway. The Wildcat was mostly out performed by the Zero. To compensate for that Thatch developed a special manoeuvre called the 'Thatch Weave'. On the fourth of June 1942 he led a six plane sortie to defend twelve Devastators from USS Yorktown when they were attacked by 15 to 20 Japanese Zeroes. Thatch order the flight to use the Thatch Weave, the first combat use of the manoeuvre. Outnumbered and outmanoeuvred the Wildcats shot down at least four Zeroes at the loss of one Wildcat. Thatch personally shot down three of these. I had to do some puzzling with the decals, see earlier post, but I think it went OK. You can read my review of the kit here. As the Americans was aware of an oncoming attack they stationed no less than 31 Catalinas as reconnaissance planes. The one I've built was piloted by Ensign Jack Reid and his crew. It was the first plane to spot the Japanese Navy at about 9:00 on 3 June 1942. They had spotted the Japanese Occupation Force 500 nautical miles west-southwest of Midway but. They reported it in as the main force which is was not, however now they knew that the attack force was coming and from where. Early in the morning the day after another Catalina torpedoed and sunk the Japanese tanker Akebono Maru. This was the only successful air-launched torpedo attack by the U.S. during the entire battle. Again I had to do some minor decal rearrangements to get the right plane. I have written a review of the kit here. In progress at the moment is the The Brewster F2A-3 Buffalo and the Grumman TBF-1C Avenger. Unfortunately these has been put away since September but soon I will be able to continue. Hopefully there will be some result in February. Meanwhile I have not been totally idle. I've settled which Nakajima B5N2 'Kate' to build but for this plane I'll need a torpedo and the kit I have only features bombs. 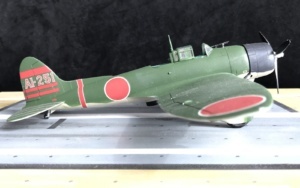 I was not able to find any suitable after market torpedo that fit the bill so I went and bought a Nakajima B6N2 'Jill' from Hasegawa that has the torpedo just to get it. 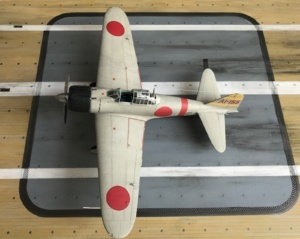 I also found an old kit of the missing Aichi E13A1 ‘Jake’, the japanese reconnaissance aircraft, in form of a very old kit but available at Ebay.